It may be the happiest day of your life, but your wedding day can also be the most stressful, especially when it comes to getting your guests to the wedding on time. If you provide wedding guest transportation, your problem goes away! Organising a wedding is a huge undertaking, with a million and one things to organise. Flowers, food, friends, family… and that’s just under ‘F’ on your list! What if there was a way to kill a million and one birds with one stone? Transport is often overlooked when planning a wedding – your job is to organise people once they arrive, not before. Right? Maybe not. Wouldn’t organising the transport for everyone ticks a lot of those boxes on your to-do list. Below are three reasons why hiring a party bus for your wedding day is the smarter and less stressful way to plan the happiest day of your life. People don’t arrive in dribs and drabs when you provide wedding guest transportation… and you can count on them arriving in time! You don’t have to worry about that one friend who is always late, or wonder if your great Aunt Betty could follow the directions you gave her. No one needs to worry about parking because they’re not driving. It’s stress free for everyone. Knowing all your guests will be there on time keeps you on schedule, so you don’t have to panic about putting back ceremonies, dinners or speeches. Everyone is together, on time and relaxed – exactly how a wedding should be. Without sounding too pessimistic, accidents do happen. And the more people driving, the higher the chance of one occurring. Add alcohol to the mix and things suddenly get a bit serious. When you hire a party bus for wedding guest transportation, those odds are reduced significantly because there’s only one trip to get everyone there safely. Our responsible, experienced drivers with clean driving records can chauffeur people around from ceremony to reception to hotel, keeping everyone safe. Having a designated driver also allows people to have a drink and not have to risk driving. This allows many of your guests to let their hair down and relax. Everyone can enjoy the party! 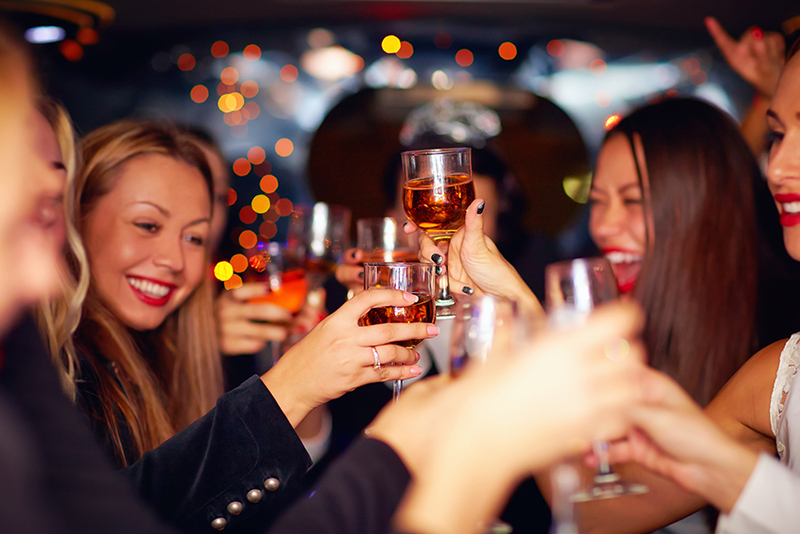 The great thing about a party bus – they’re designed for fun! Weddings are supposed to be happy times. They are an occasion to be enjoyed. Organising carpools, arrival times, arguing over who’s driving and who can or can’t have a drink, is not much fun. Hiring a party bus for your wedding guest tranportation allows them to cut loose and enjoy themselves. Weddings are all about friends and family, and sharing that moment together. Everyone staying together and partying sets the tone for the day, and makes sure the memories people take home are happy ones. Our party bus has music, drinks and food. There’s even karaoke if you really want to get your wedding guests in the party mood! Giving people the opportunity to chill out and have a good time is also a nice way to say thank you to your guests. Some people will have come a long way to attend your wedding, others maybe spent money on your wedding that would have otherwise gone on a holiday. 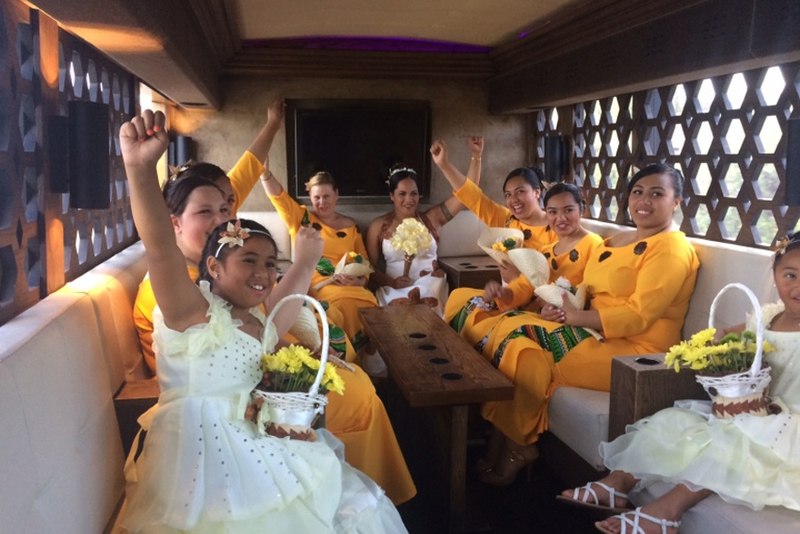 A party bus offers a special and unique wedding experience that says thanks for everyone’s efforts in being here. Our Double Decker is perfect for large groups. Seating up to 75, this is a safe and easy way to get most, if not all, of your guests from A to B. For style and comfort our VIPER Lounge Coach is the perfect way to travel. This amazing limo coach is fully licensed and not like any bus or coach you have seen before. Get your guests in the party mood by bringing everyone to the reception in this bad boy! At some point in the night your guests may really appreciate the on-board toilet facilities of the single level Coach. With up to 46 seats, your guests can travel further distances, and do it comfortably. If budget is your main concern, then the Standard Bus is the perfect for those last-minute solutions to wedding guest transport. Seating up to 45, you can book one or two and have peace of mind that your guests are traveling home safely. If you would like to know more about our wedding transport options, then please don’t hesitate to contact us today. Our friendly and experienced staff will be happy to answer any questions you may have.